CABO SAN LUCAS, Mexico (AP) -- Mexican authorities evacuated people from low-lying areas around the resort city Cabo San Lucas as a slightly weakened Tropical Storm Javier churned near the tip of Mexico's Baja California Peninsula. Slowing its forward movement to 5 mph (7 kph), Javier promised an extended battering with wind and rain through Wednesday morning as it headed northward brushing the Pacific shore of southern Baja. The storm was centered about 30 miles (50 kilometers) south-southeast of Cabo San Lucas late Monday, with maximum sustained winds of 60 mph (95 kph), down from a peak of 65 mph (100 kph), the U.S. National Hurricane Center said. It said a weakening trend should begin Tuesday afternoon. The center said two to four inches of rain could fall on the peninsula's southern portion, with possible maximum amounts up to eight inches in isolated spots. Authorities in Cabo San Lucas set up 10 storm shelters, mostly at local schools, and moved families from homes in low-lying areas near streams. The resort was closed to navigation, and some owners of smaller fishing boats could be seen pulling them onto shore and hauling them away on trailers. 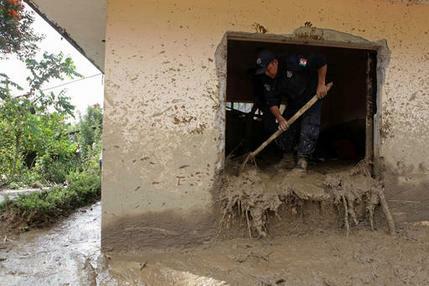 Meanwhile, towns in central and eastern Mexico continued to clean up from the remnants of Hurricane Earl, which triggered landslides that killed 45 people in Veracruz and Puebla states over the weekend. Among the casualties of Earl were at least 32 people who died in multiple mudslides in the mountainous north of Puebla, state Interior Secretary Diodoro Carrasco said. He said rain amounts equivalent to an entire month of normal precipitation fell in one night in some areas. In neighboring Veracruz, 13 people lost their lives when mudslides hit the towns of Coscomatepec, Tequila and Huayacocotla, Gov. Javier Duarte said. 0 Response to "TROPICAL STORM JAVIER CHURNS NEAR TIP OF MEXICO'S BAJA"